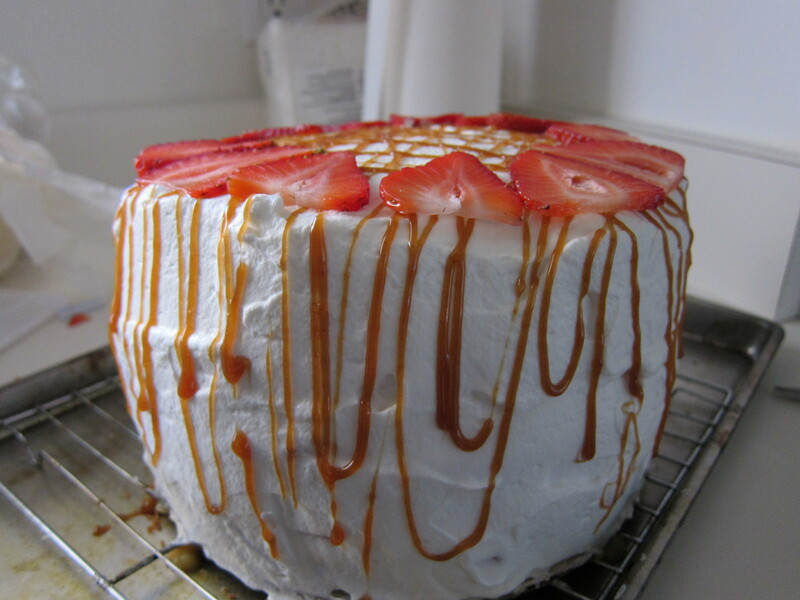 Uncle’s Birthday Cake: Vanilla, Strawberry, Salted Caramel Cake! 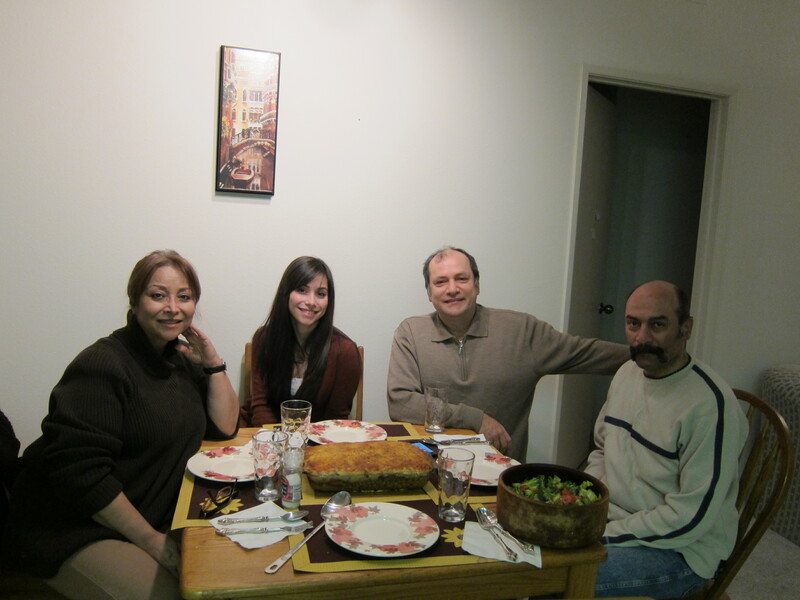 So my Uncle is visiting from Iran and it was his birthday last week. To celebrate, we threw him a party at my apartment and I made cake! As we know, I’m still new to the world of cakes, especially layered ones, but I think this one turned out even better than the last! My Uncle likes very simple flavors. 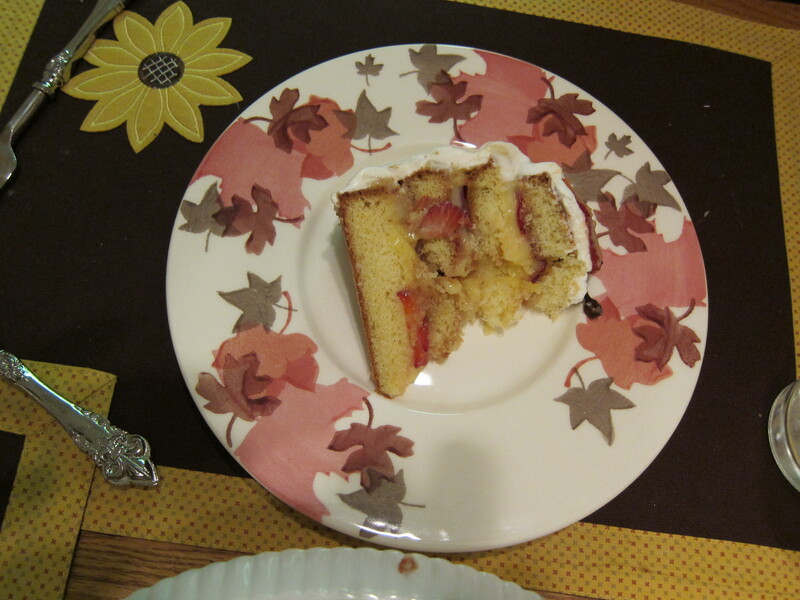 I immediately knew I was going with a simple yellow butter cake recipe. 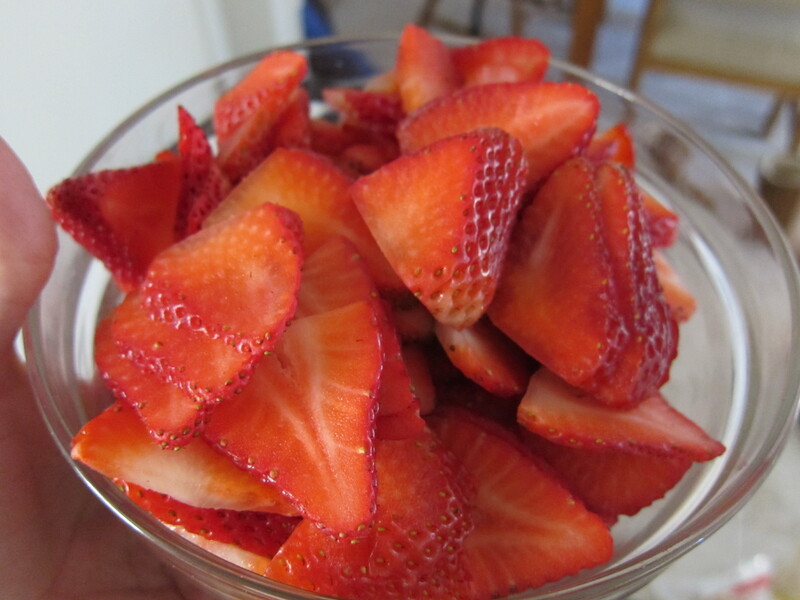 He also likes strawberries a lot, so that was a yes. 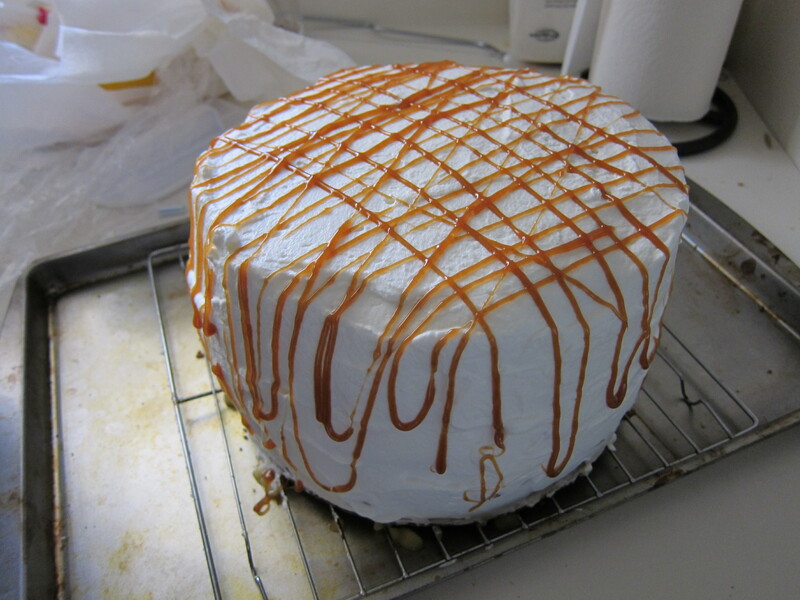 I thought I’d, then, kick it up a notch with some homemade salted caramel and bam! We had our cake flavors. As always, I preheated the oven to 350. Then I buttered and floured my pan. It was a 9″ pan. Pour into prepared pan, and bake for 30-35 minutes or until toothpick comes out clean. Once it’s done, pop it out of the oven and put it on a cooling rack. And if you’re like me and only have one 9″ pan, then re-butter and flour your pan and pour more batter into and pop it back in the oven. When that one is ready take it out and place on cooling rack. 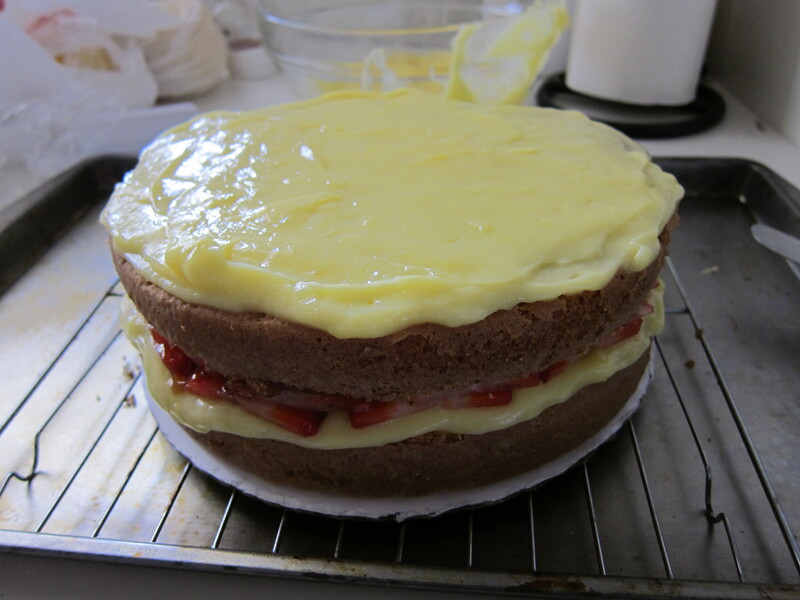 Now, this time, I was prepared and I bought a cake leveler [unfortunately I forgot to take a picture of it]. Split your layers. 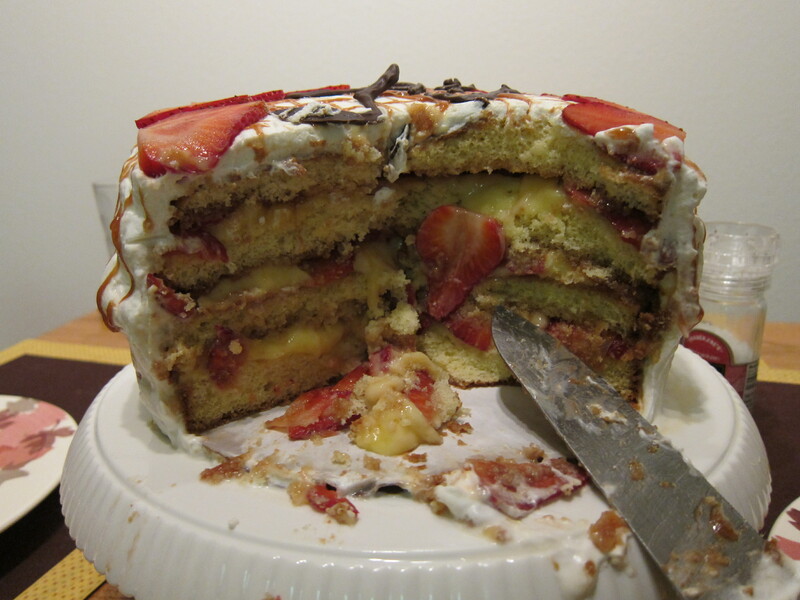 Let the cake layers cool further. Make a stiff whipped cream and a standard vanilla custard. Put them in the fridge to cool. 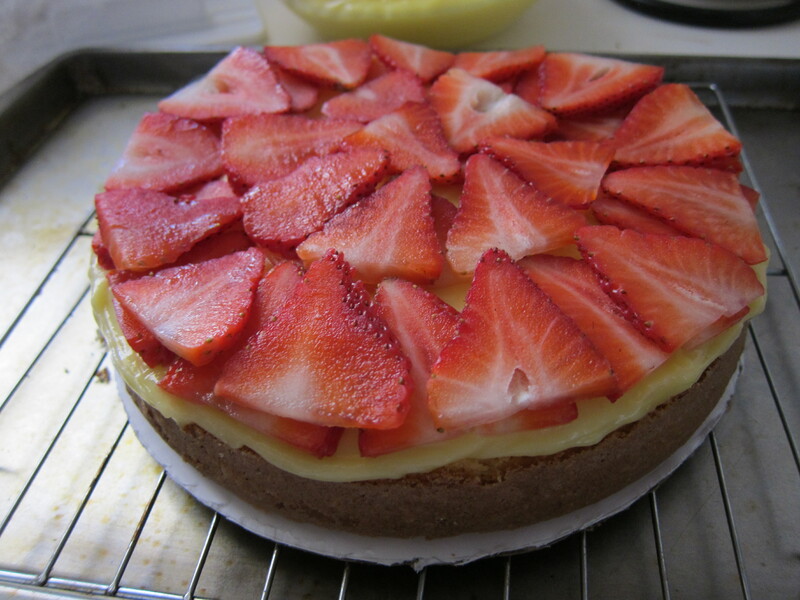 If you haven’t already [I did this while I waited for the cakes to bake], slice your strawberries as evenly as possible. Let’s get to our caramel! I bought a handful of fleur de sel from France and jump at the opportunity to use it. 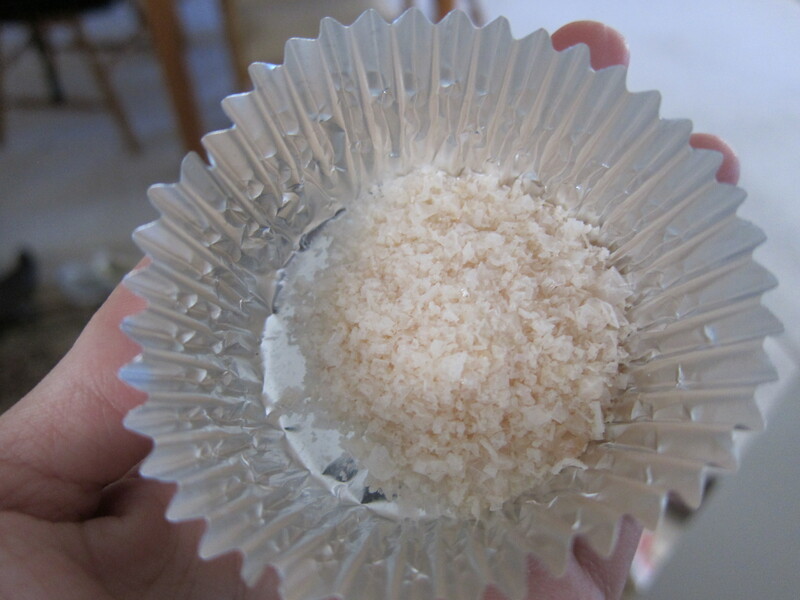 If you don’t have fleur de sel handy, regular sea salt will totally suffice. Here’s my fleur de sel. To make the salted caramel, bring the corn syrup, water and sugar to a boil. Rule of thumb, when working with hot sugar, always use a wooden spoon. Makes clean up waaaaaay easier. Now, with a candy thermometer, bring the mixture up to 350 degrees. If you don’t have a candy thermometer handy, watch the mixture very carefully. After 10 minutes of it boiling on high, the mixture will start to rapidly turn color. When it turns a dark amber, that’s when it’s around 350 degrees. When it reaches this point, pour in you cream. Be careful becuase the mixture will steam and spurt. Mix quickly with your wooden spoon. Once it’s thoroughly mixed and gooey, pour in the fleur de sel. Yum! What a pretty color! Alright, now we are ready for assembly! 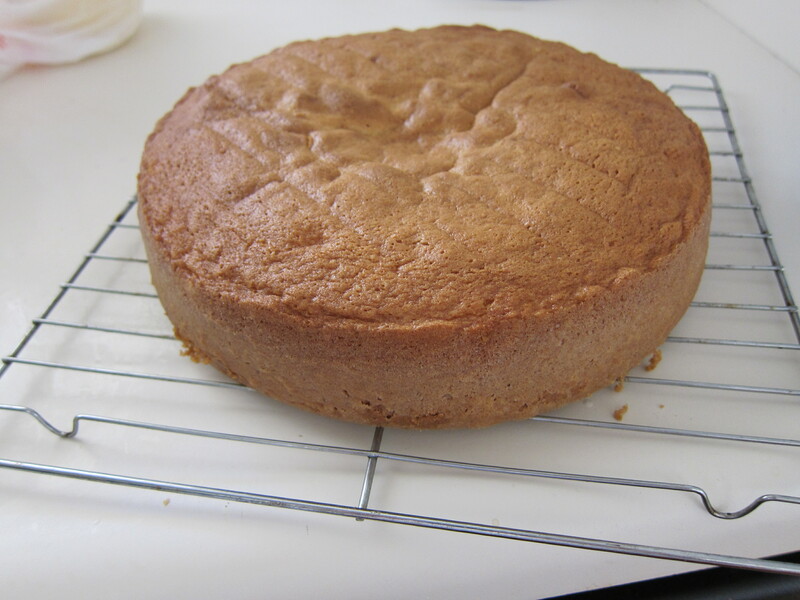 Cut out an appropriate sized cake board and place ir on a cooling rack over a cookie sheet and put the first layer of cake on the board. 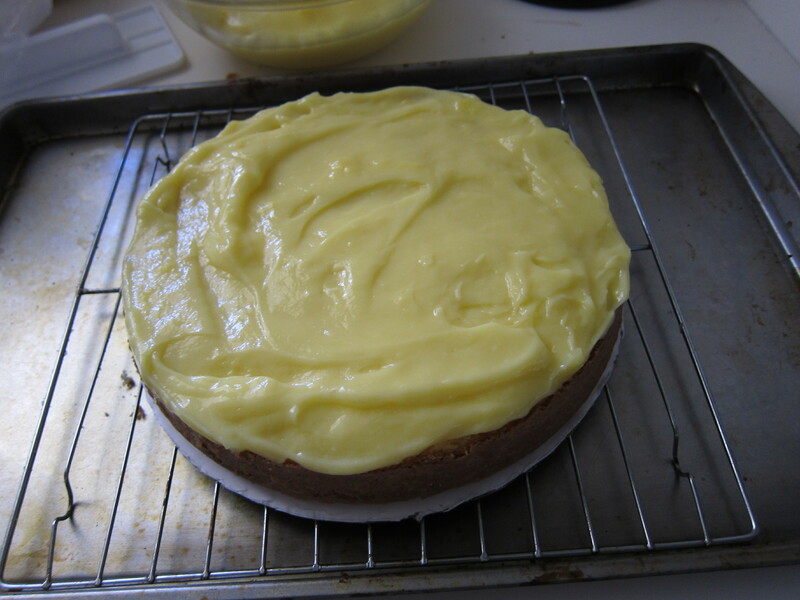 SMear a layer of vanilla custard on the cake. 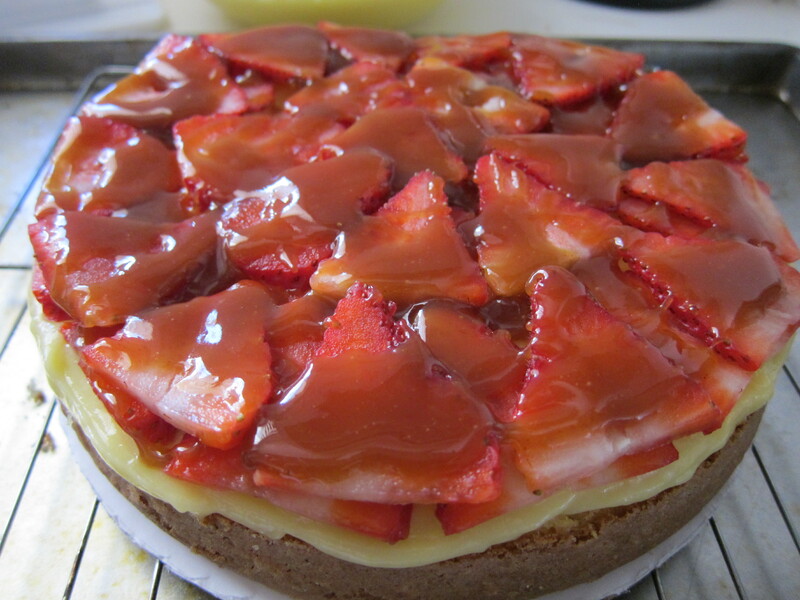 I placed my cooled caramel [if it gets too thick re heat it quickly] in a pastry bag and poured a layer of salted caramel on the strawberries. 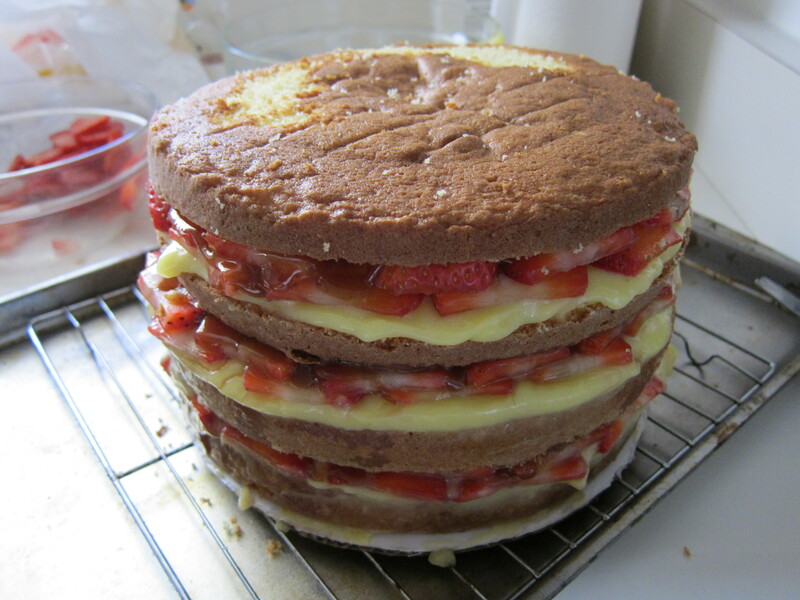 Place the next layer of cake on. 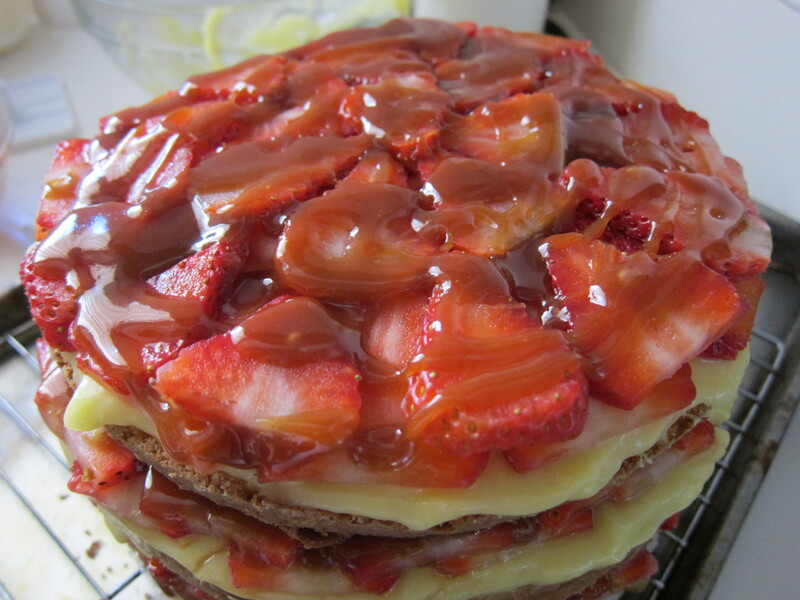 Place more caramel and then the next layer with custard on top!. If you look very closely there are 3 circles in the cake. These were my “dowels”. I used crazy straws. They worked really well! And cheaper! 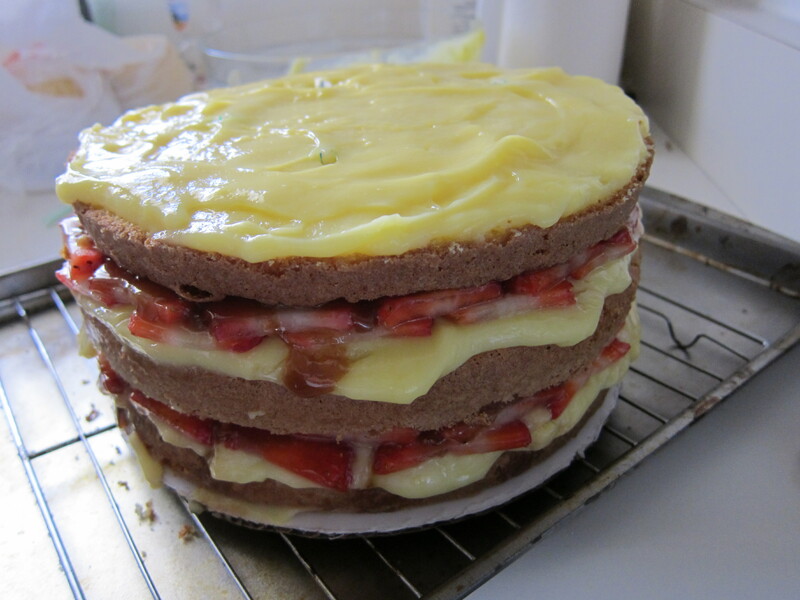 Place the last layer of cake on top. 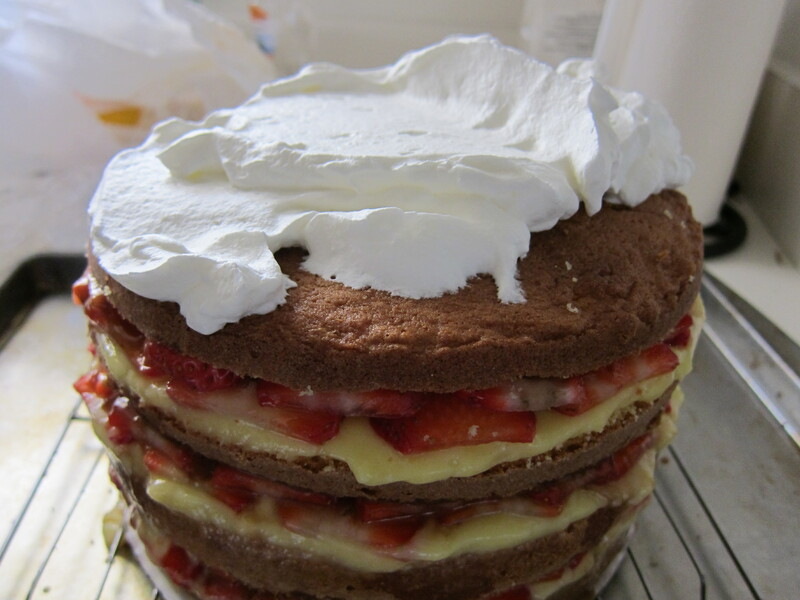 Now take the whipped cream out of the fridge and plop it right on. Spread it all over the cake. 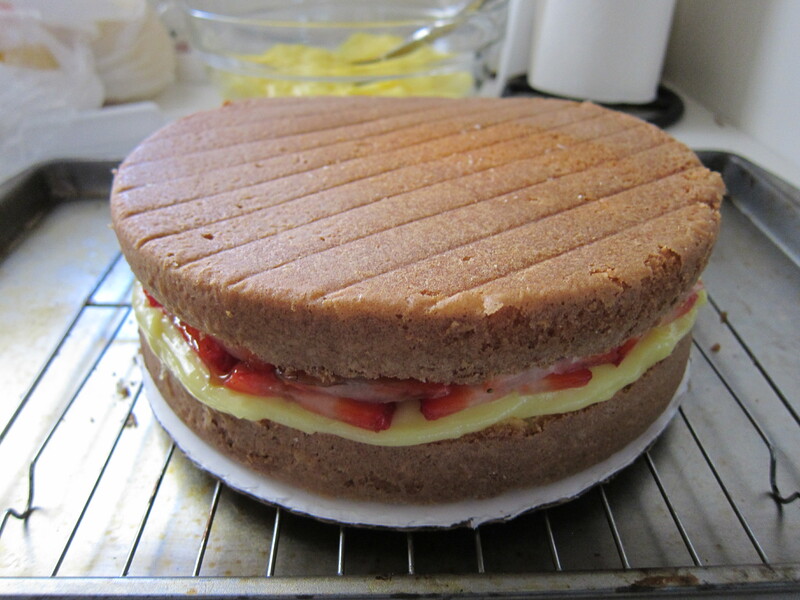 First in a crumb coat [a very thin fine layer that covers all the cake] then put a thicker smooth layer of whipped cream. I decided on the whipped cream because my Uncle doesn’t like overly sweet frostings. In hindsight, I should have used 7-minute frosting. I was going for a light unsweetened frosting type thing, the whipped cream was perfect, if you were going to eat the whole cake the day you make it. But whipped cream doesn’t hold up well over time. 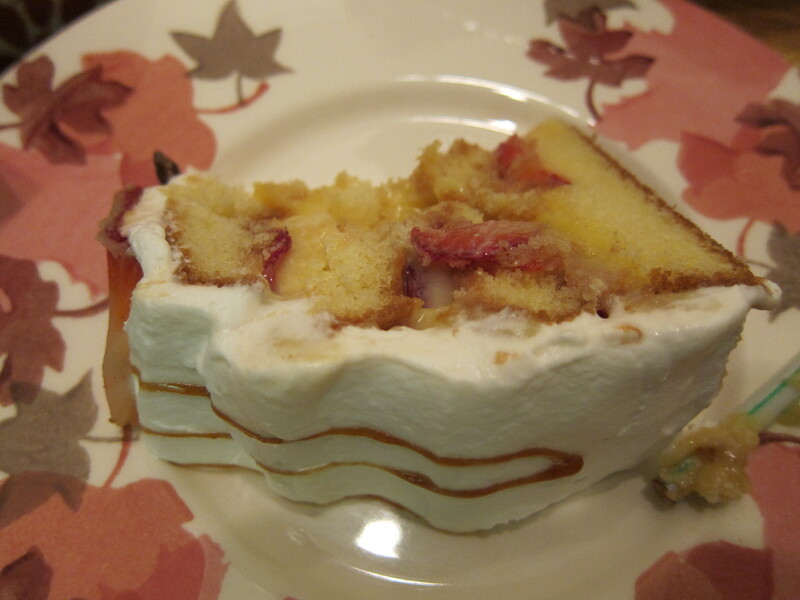 I recommend for those of you who don’t want to eat the cake in it’s entirety to use Martha Stewart’s Seven Minute Frosting, but instead of 1.5 c of sugar, I’d use .5 c. I was really just looking for a simple, fluffy, barely sweet thing I could cover the cake in. Trust, me that’ll do the trick and will hold up in the fridge. 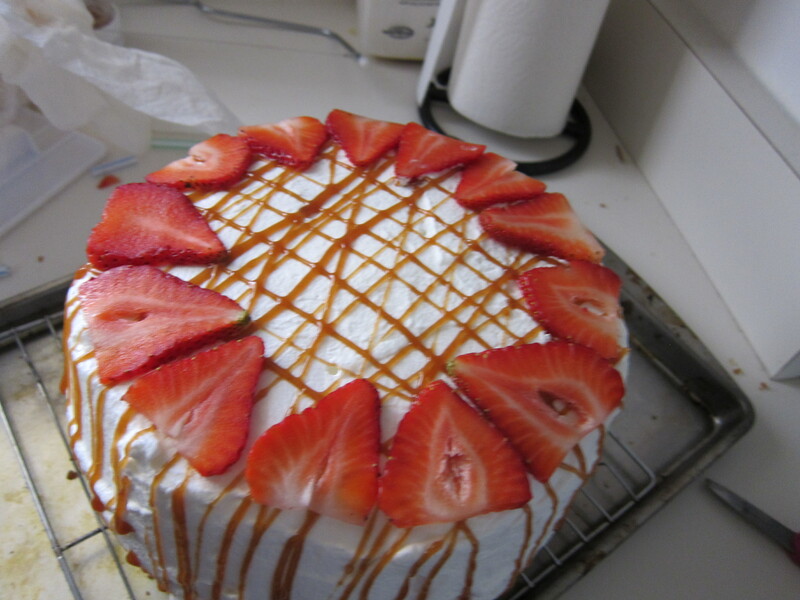 Anyway, I covered the cake in whipped cream and then drizzled caramel over it. 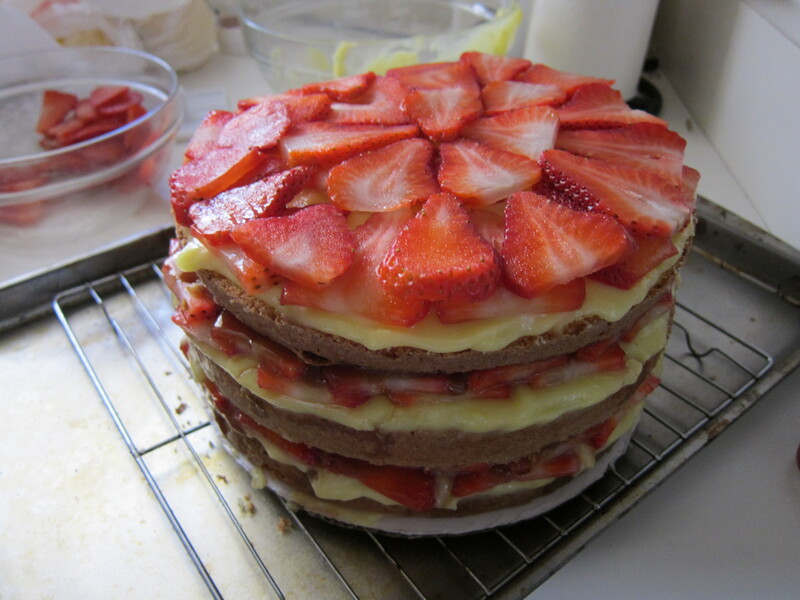 Then I decorated it with a round of strawberries. Then I melted some dark chocolate melts and wrote a happy birthday message on the cake. 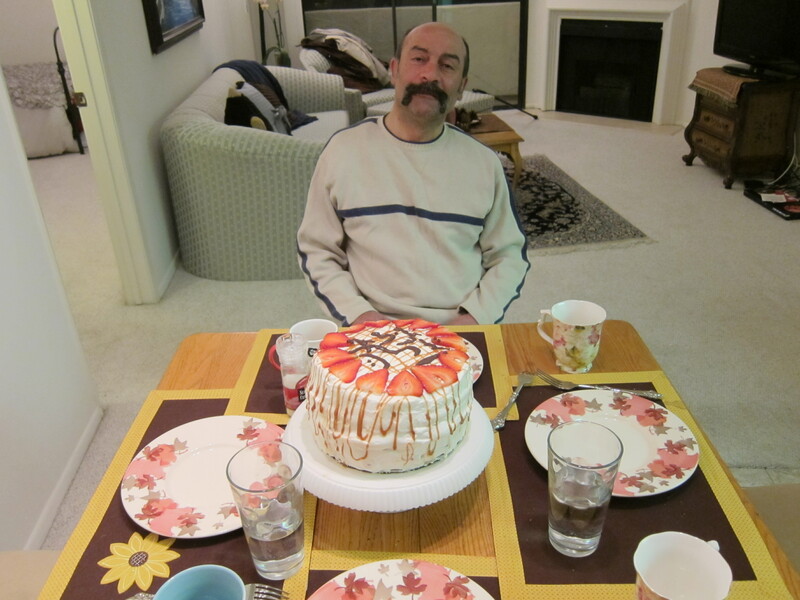 My Uncle with his Birthday Cake! 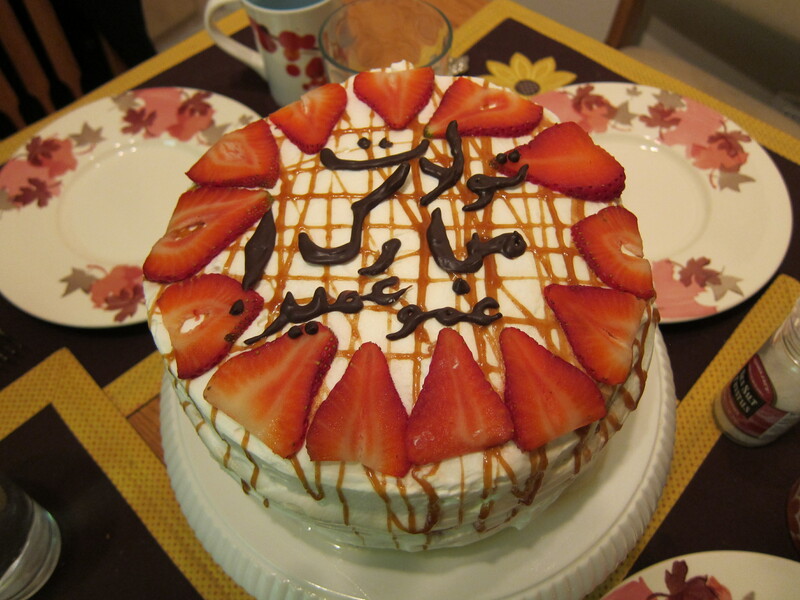 The cake tasted very delicious! This is what it looked like once we were done with it. Preheat oven to 350 degrees. 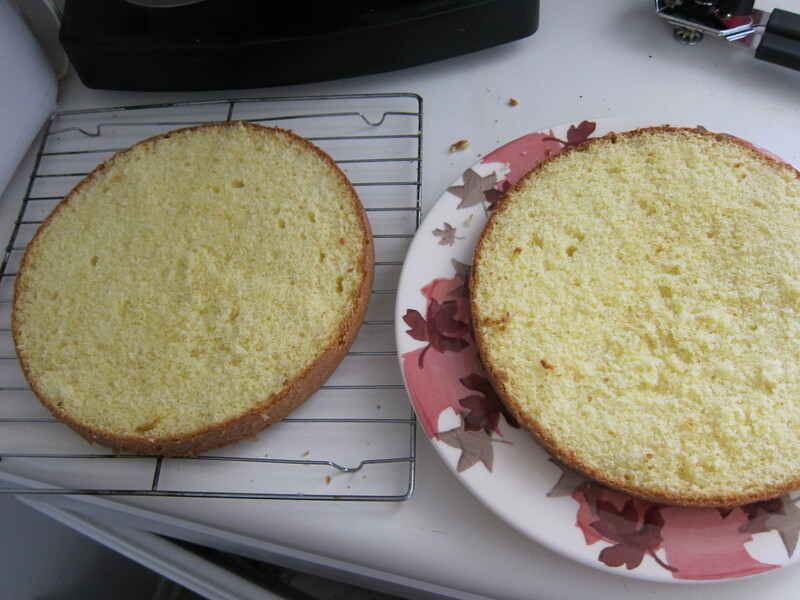 Butter two 9-by-2-inch round cake pans; line the bottoms with parchment paper. Butter parchment, and dust with flour, tapping out excess; set aside. Into a medium bowl, sift together flours, baking powder, and salt; set aside. 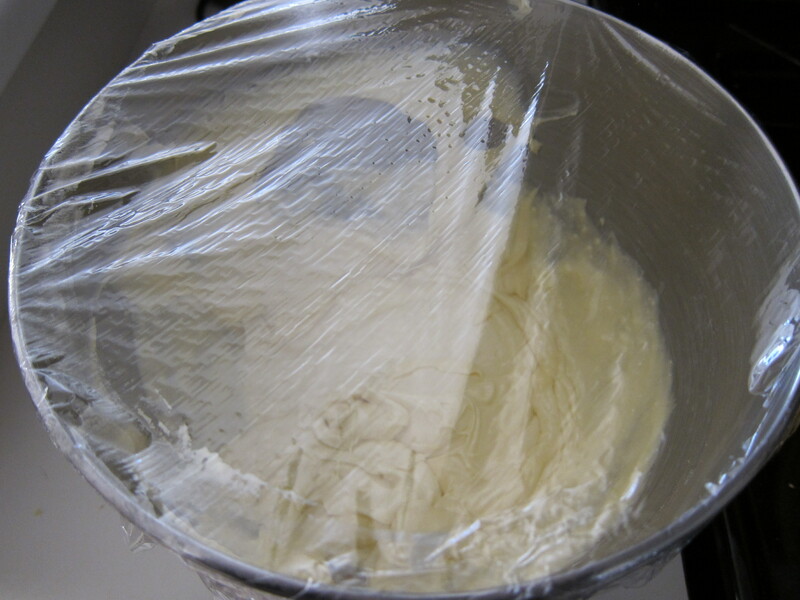 Divide batter between the prepared pans, and smooth with an offset spatula. 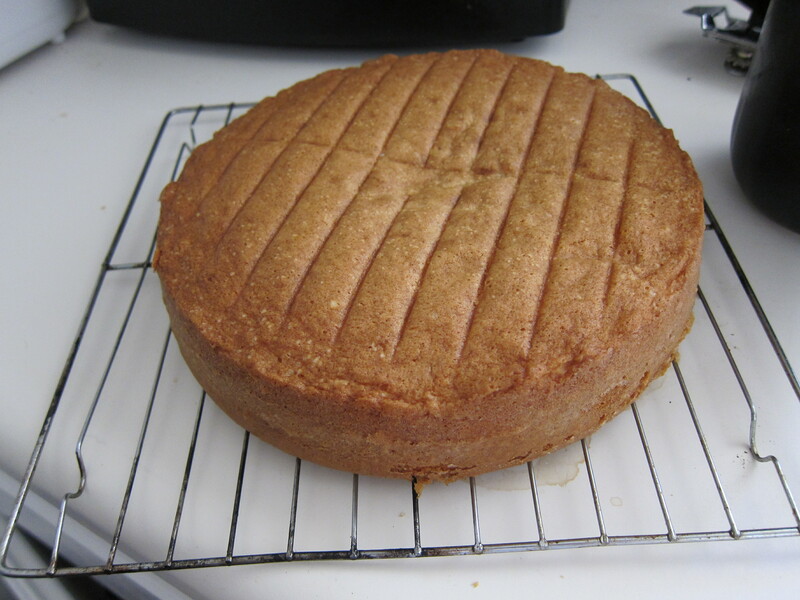 Bake, rotating the pans halfway through, until cakes are golden brown and a cake tester inserted into the center comes out clean, 30 to 35 minutes. Transfer pans to a wire rack to cool 20 minutes. Invert cakes onto the rack; peel off the parchment. 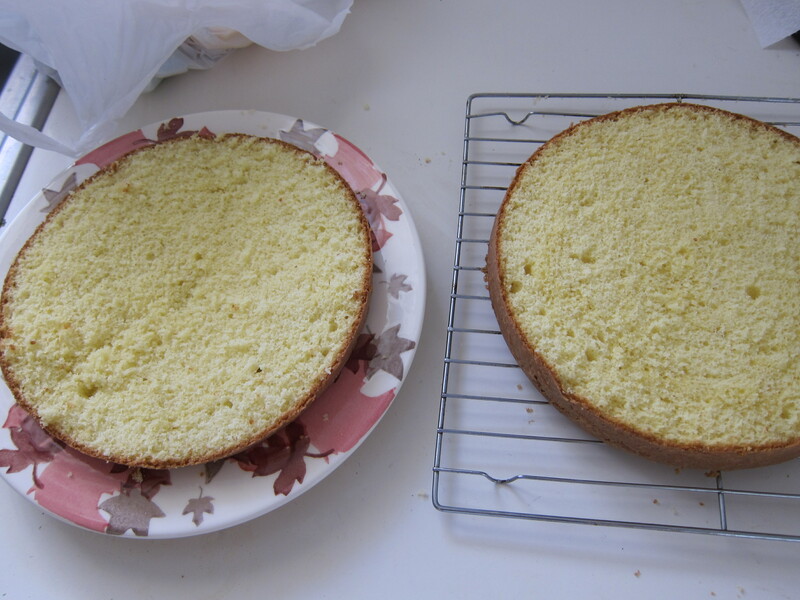 Reinvert cakes and let them cool completely, top sides up. Heat oven to 300 degrees. Place an oven rack one-third of the way up from the bottom. Choose a small roasting pan large enough to hold four 6-ounce custard cups, and fill it with enough water to go halfway up the sides of cups. Place pan without cups in the oven. Meanwhile, combine cream, milk, and vanilla bean in a medium saucepan; bring to boil. Whisk together the yolks and sugar in a medium bowl until light and fluffy. Slowly whisk in the hot milk until completely combined, then pour into baking dish, and place into the pan of hot water. Bake on the lower shelf until the custard has set and is no longer liquid when lightly touched in the center, 30 to 40 minutes. 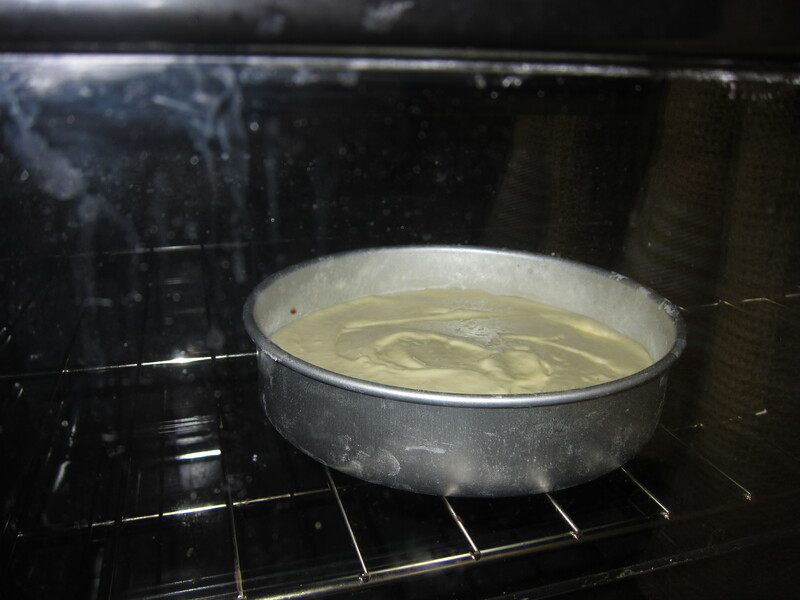 Remove pan from the oven, remove custard pan from the water, and place on a wire rack to cool. Chill. 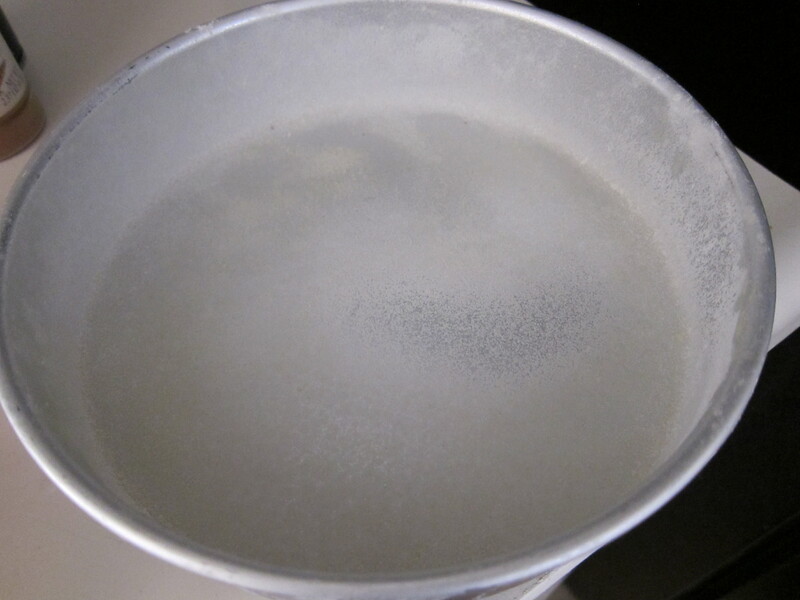 Combine 1/4 cup water, sugar, and corn syrup in a medium saucepan; stir to combine. Bring to a boil over high heat. Cook until the mixture reaches 350 degrees on a candy thermometer, about 10 minutes. Meanwhile, in another small saucepan, mix together cream and salt. 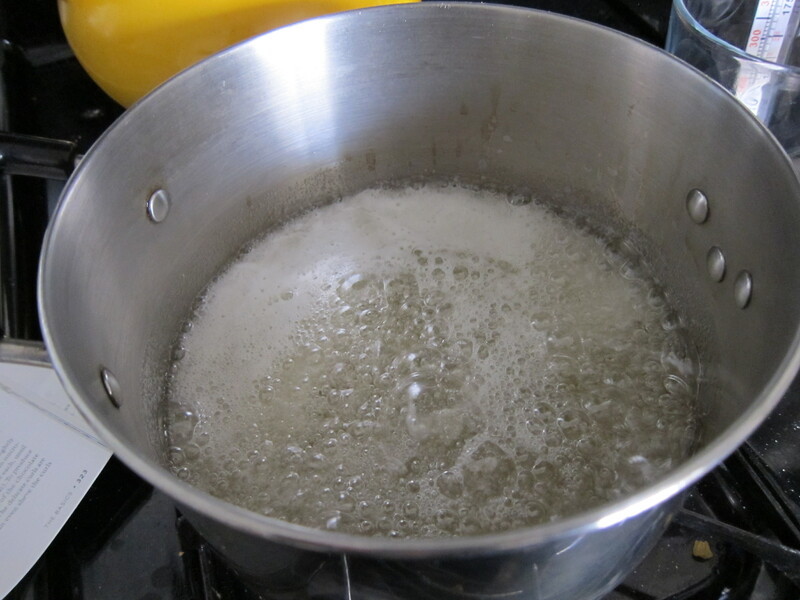 Bring cream to a boil and cook until salt has dissolved, 3 to 5 minutes. Remove from heat and set aside. 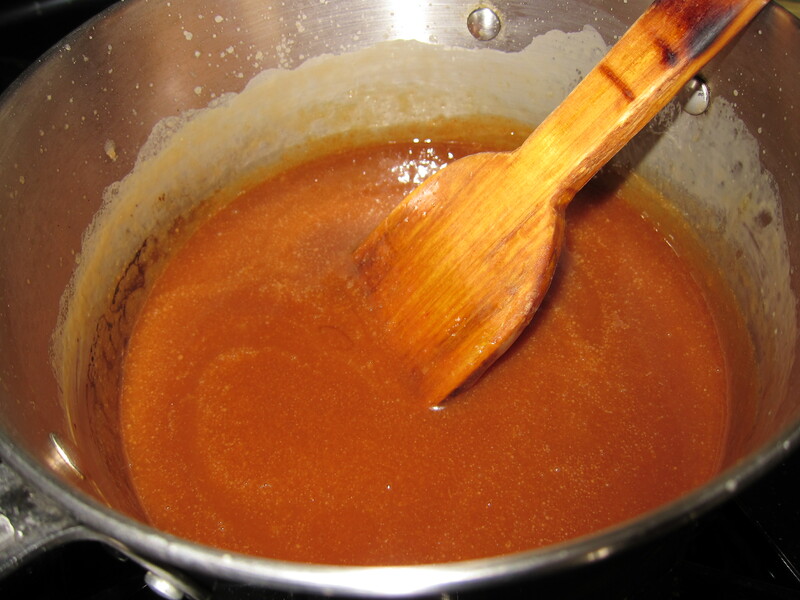 When the caramel mixture has reached 350 degrees, remove from heat and allow to cool for 1 minute. Carefully add the hot cream to the caramel; stir to combine. Whisk in sour cream. Cool, and store in an airtight container, refrigerated, for up to 3 days. Repeat until all the layers are done. I hope you guys have a good day! 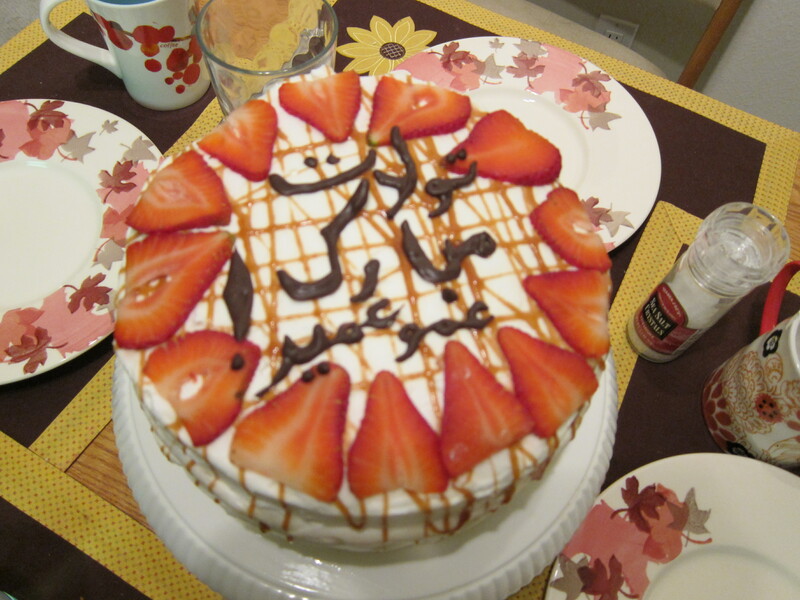 Is that how you write delicious in Farsi? 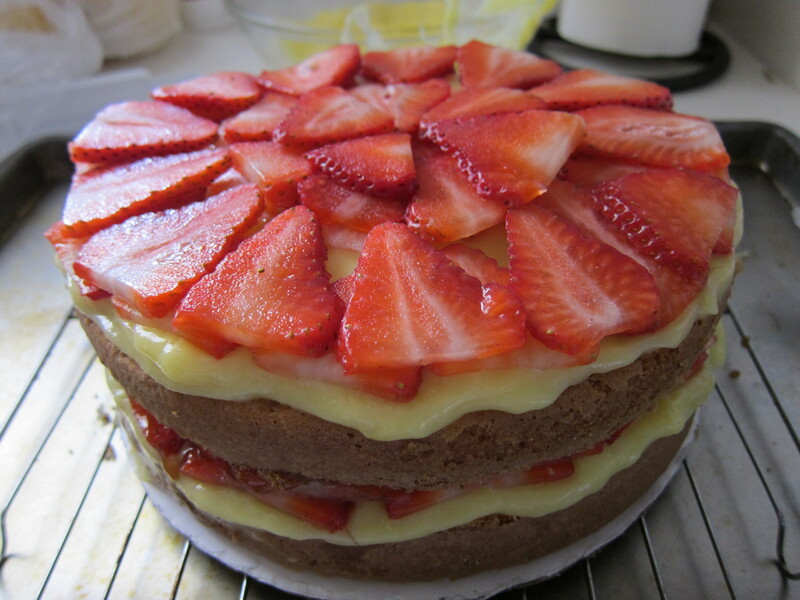 That looks so epic… epically delicious. Oh Thanks, It was pretty epic.